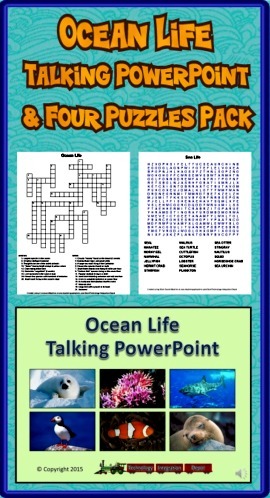 Turn down the lights and turn up the volume for the Ocean Life Talking PowerPoint! This slideshow highlights 48 creatures found at the ocean. Each slide is narrated so students can progress through the presentation in a computer lab setting. Ideal for introducing topics children can select for further study. Also included are two crossword puzzles and two word searches basic upon facts found in the presentation. Answer sheets are included. Enjoy! 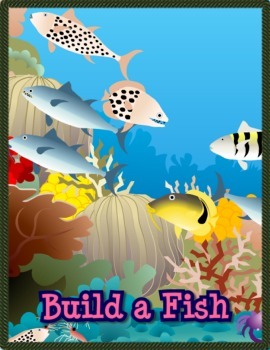 Build a Fish by choosing a body, mouth, and color/pattern, then release it into the reef! You can drive your fish around the reef in search of food and to evade predators. Can your fish find enough food without being eaten? 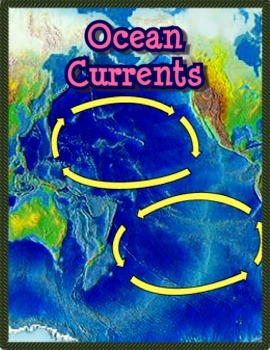 Currents are cohesive streams of seawater that circulate through the oceans. Some are short-lived and small, while others are vast flows that take centuries to complete a circuit of the globe. The Gulf Stream Current, which shows up in this temperature coded satellite image as a broad dark orange swath, has followed this course through the North Atlantic for millennia.